When I’m out in the field, I get a lot of questions about telematics. Customers are curious about how to use the data, when to use it, etc. I also get a lot of questions around ActiveCare Direct, Volvo’s 24/7/365 active machine monitoring and fleet utilization reporting service. How is ActiveCare direct different from CareTrack? CareTrack is the actual data collecting telematics system, and ActiveCare Direct is a service to help customers understand and manage that data. 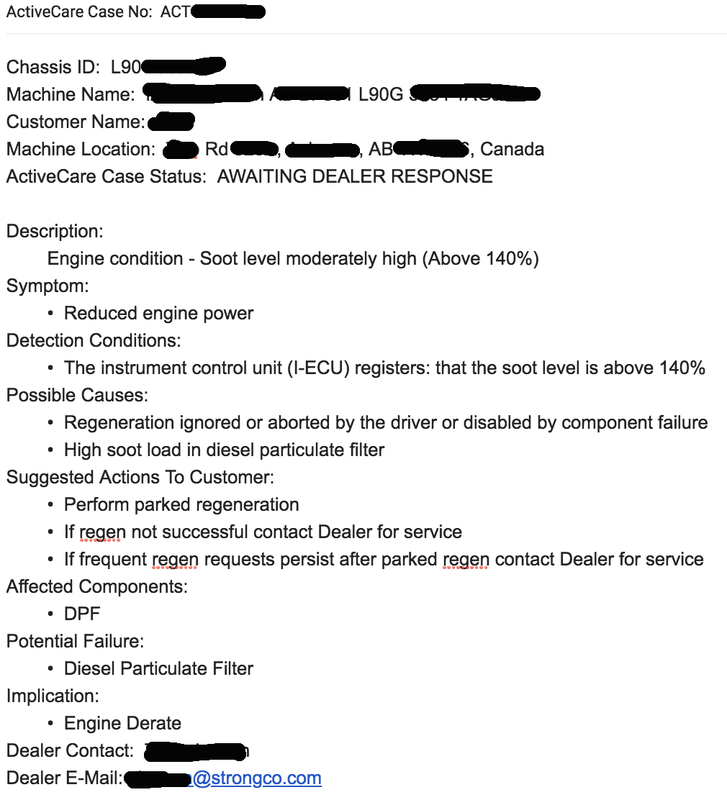 With ActiveCare Direct, Volvo analysts and a proprietary software sort through all the data CareTrack collects from a machine, filters it and prioritizes alarm codes into only those that require action from you or your dealer. 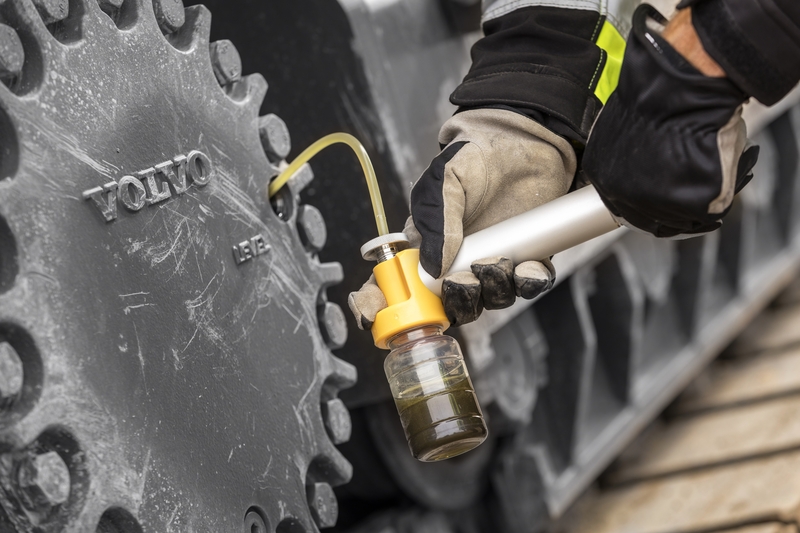 Additionally, Volvo delivers monthly fleet utilization reports, which provide an easy-to-digest overview of your fleet’s performance, efficiency, hours and instances of machine misuse. Check out my earlier blog post that further explains the two and shows how upgrading to ActiveCare Direct can take your fleet management to the next level. What’s the difference between a fault code and a case alert? Fault codes are what you’re used to getting from telematics systems: a string of numbers and/or letters that indicate an issue but provide no further information. You likely have to look up what the fault code means, and then try figure what the problem is and how you might resolve it. Here’s a sample of what a typical fault code looks like (with customer information blacked out). With ActiveCare Direct, as I’ve already mentioned, your telematics data is analyzed for you. Instead of only a fault code, you’ll receive a case alert that provides a probable cause of the issue, a recommended solution, and the potential consequences of not taking action. Here’s a sample of what a case alert looks like (with customer information blacked out). A bit more helpful than a fault code, right? How are issues prioritized? How can I be sure problems don’t fall through the cracks? – Priority 1 cases: These typically go to your dealer but can go to you as well. Priority 1 cases include critical scenarios that put the machine at risk of going down. machine down (like putting in new parts). – Priority 4 cases: These cases involve service planning. For example, if a scheduled maintenance is coming up (e.g., a 500-hour interval), these simply let you and your dealer know it’s time to schedule service. It’s also important to note that a certain set of conditions will cause a case to open. For example, if new fault codes related to a case are triggered, you won’t be alerted again — the code will be added to the open case’s alarm count. It’s all about helping you and your dealer take big data down to a more manageable size. And to ensure cases are managed in a timely manner, Volvo sets a schedule for follow-up if an action hasn’t taken place. Is Volvo monitoring machines to ensure the data is accurate and the machine is sending the information where it’s supposed to go? Yes. With ActiveCare Direct, machines are monitored for proper data delivery and accurate data. If issues are noticed, a case is created and distributed through the normal case process. Does Volvo still offer CareTrack? Absolutely. Customers enrolled in ActiveCare Direct still have access to the CareTrack portal to set up and manage features such as location tracking, geofencing and time fencing. ActiveCare Direct can make life a lot easier for our customers. As an example, Tony Brignolli, co-owner and vice president of Saltmarsh Industries, Inc., shared with us how telematics (specifically ActiveCare Direct) has enabled his growing company to bid more successfully and reduce their costs. If you have additional questions about telematics, or ActiveCare Direct specifically, leave a comment below or feel free to contact me at david.adams@volvo.com.